1957 Chevy Bel Air Convertible - Matador Red BEAUTY! 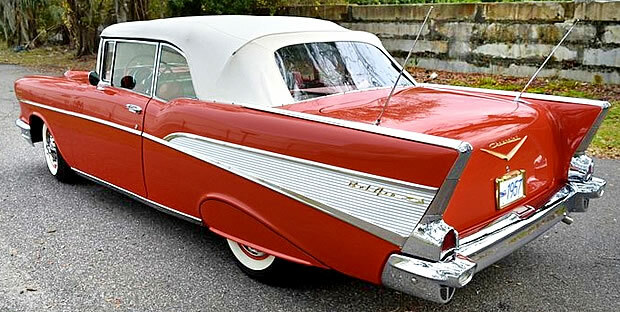 For anyone with even a passing interest in old cars, the 1957 Chevrolet has to be one of the most recognizable cars ever. Its beautiful lines and iconic design has meant it is, arguably, become one of the most popular cars to own. Add in that this is a convertible and you have one highly desirable car with values climbing considerably over the last 30 years or so. Chevrolet offered 19 models over three series that year: the One-Fifty, Two-Ten and the Bel-Air with the latter being the top series. The Bel Air was richly appointed and one of its most distinguishing features was the brushed aluminum panel between the wedge shape formed by the two sloping chrome strips. 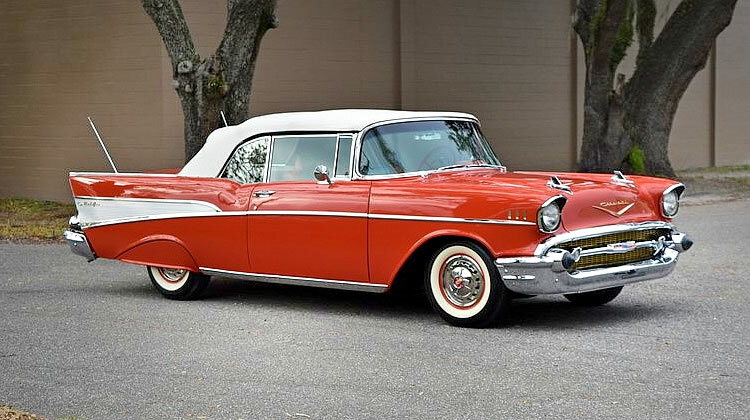 This 1957 Chevrolet Bel Air Convertible is painted in Matador Red and has a beige fabric top. The 1957 Chevrolet is 200" long with a 115" wheelbase and is 73.9" wide. 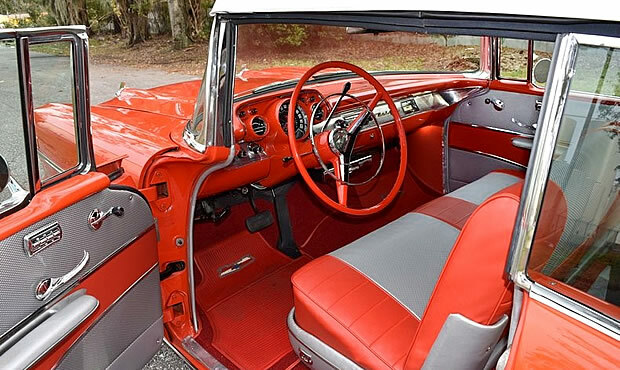 The interior of this Bel Air is a Red Vinyl and Silver Pattern Vinyl combination that was one of four different styles available for the convertible. Power comes from the new for 1957, 283 cubic inch V8. This particular car is equipped with the power Pack option giving an output of 220 hp. Primary competition for Chevrolet in '57 would have been the Ford Fairlane 500, Plymouth Belvedere and the Studebaker President. Chevrolet produced 47,562 Bel Air convertibles for the 1957 model year. Base price was $2,511 for the 235.5 cubic inch six-cylinder and $2,611 for the base V8 which was a 265 cubic inch Turbo-Fire. Another $34 got you the 283 Super Turbo-Fire. Powerglide automatic transmission cost a further $188. My brother has one of these in red and I want to keep up with him and trade one of my cars.